Update:TCCC and Coca-Cola Amatil have begun blocking e-mails from our supporters. Your message will be delivered to both companies as part of a signed petition. Nearly twenty years after Indonesia freed itself from an oppressive military dictatorship, workers at the Indonesian operations of The Coca-Cola Company's Australian-based bottler Coca-Cola Amatil (CCA) are still waiting for democratic rights at the workplace. 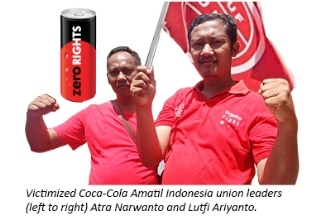 Workers at Coca-Cola Amatil Indonesia are organizing to form independent democratic unions. The company has responded by systematically attacking their members and elected leaders. CCA has reacted to the formation of independent unions at two company locations by terminating, forcefully transferring and suspending union leaders Atra Narwanto and Lutfi Ariyanto to prevent them carrying out their roles as union presidents. Members of the new, independent unions are systematically harassed. And when 150 workers at the Surabaya plant signed a petition expressing their lack of confidence in the Suharto-era worker organization which CCA insists on imposing, they were pressured by management to withdraw their signatures. CCA's partner in repressing human rights is the SPSI-RTMM (National Union of Tobacco, Food and Beverage Employees of Indonesia), an organization descended from the vehicle created by the Suharto military dictatorship to prevent workers from organizing to defend their human rights. In Indonesia, Coca-Cola Amatil retains Suharto era Collective Bargaining Agreements that are effectively disciplinary codes to control and manage the workforce. They date from an era when questioning the actions of worker organizations appointed and sustained by the military was legally tantamount to sedition. The IUF has repeatedly brought these violations to the attention of The Coca-Cola Company (TCCC) and CCA. The abuses continue, in full violation of internationally recognized human rights instruments. Independent unions at Coca-Cola Amatil Indonesia are not only fighting for the rights of their members. They are fighting to defend the rights of all workers in Indonesia who are standing up to defend human rights and secure the country's democratic future against the legacy of an authoritarian past. The vestiges of lengthy military rule remain firmly in place at Coca-Cola Amatil Indonesia, the company which manufactures Indonesia's most widely recognized global brand. USE THE FORM BELOW TO SEND A MESSAGE to Coca-Cola Amatil operating in Indonesia and The Coca-Cola Company in the US, insisting they act to ensure these ongoing human rights violations are remedied by restoring the rights of victimized trade union leaders Atra Narwanto and Lutfi Ariyanto and recognizing and negotiating with independent, democratic trade unions at Coca-Cola Amatil Indonesia.